The banner o Iraq (Arabic: علم العراق‎) haes haed a nummer o different designs syne the Kinrick o Iraq wis established in 1921. The current banner wis adoptit in 2008 for a year an is intendit tae be an interim meisur till a permanent solution tae the banner issue is foond. Note that, as wi ither banners inscribed wi Arabic script — in this case Allahu Akbar ("God is greater") — the hoist is tae the richt o the obverse (front) o the banner. 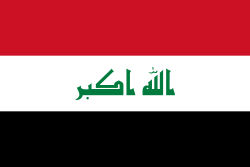 Wikimedia Commons haes media relatit tae Flags of Iraq.